There are many platforms available for building websites. Among the lot, stern competition exists between Squarespace and WordPress for building the websites. This is because both have the potential to help you create a beautiful and excellent websites. However, as the two platforms are ideal products for different enterprise app development, they come with their advantages and disadvantages. These two platforms can be compared to a great extent in the following ways. WordPress is open source. It’s code is open for everyone to tweak and customize as per their own requirements. So, any enterprise app development company or individual can create their custom themes and plugins and share with other users in the community. This gives users a great flexibility to choose whatever theme and plugin depending on individual choices and needs. The case with Squarespace is not the same as WordPress. The themes and plugins are made by the in-app developers which significantly hinder flexibility. Also, WordPress can be used to build any website as a lot of plugins can be used to add functionality to the website. The main reason behind the popularity of WordPress is its powerful, extensive resources. As an open-source platform, WordPress has tons of free and paid plugins available for its users. Also, to make the website beautiful and attractive to visitors, there are also thousands of themes to choose from; to express user’s emotions and interest. These themes come in various categories regardless of the kind of industry the website is for. Also, installation of these themes and plugins is straightforward to do as they come with their help and support. Squarespace, on the other hand, has limited themes and plugins. Those available are the one customized by its enterprise app development company which cannot be tweaked in any way whatsoever. 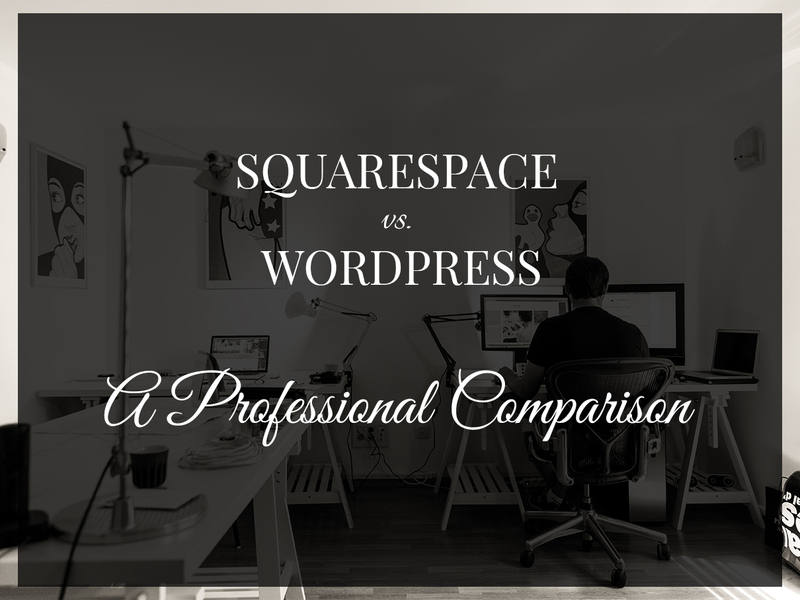 So, when it comes to design and features, WordPress beats Squarespace. WordPress development is a very advanced one as it offers it users’ flexibility to a great extent. As an open-source platform, its the coding and decoding is open to everyone. That means it is highly customizable for anyone who has knowledge of coding. Also, the service of an expert in enterprise app development could be sought for in case the user knows too little about coding. WordPress is open-source and all when compared to Squarespace, learning it is difficult. Squarespace is not an open-source platform and restrictive, but even someone who is not technology inclined can easily get his or her way around it. When building a website, the user gets to see how the website would look like even before it’s ready unlike WordPress, where the website can be seen only when it is ready. So, for beginners, WordPress might not be the best choice unless time is invested in learning how to go about it. Being an open-source platform, WordPress has a massive database of forums, tutorials, and videos for its users. This is good because helps come in easy with community support. As good as this sounds, at times, it might be difficult to find reasonable help because the help resource is jam-packed with thousands of individual contribution which is not organized for easy accessibility. Squarespace, on the other hand, has a well-organized forum, articles, and videos which make getting help quite easy. Squarespace has a payment platform which starts from about $4 to $10 per month for hosting and about $10 to $12 per year for a domain name. Though it may seem cheap, it is constrained. WordPress has made everything on its platform free. The only thing to be paid for is web hosting and getting a domain name. The cost of web hosting depends on the hosting provider being patronized. However, WordPress development platform has a guide on how to choose the best cost saving hosting. The user has the absolute control over what to pay for on his or her website. Therefore, compared to another platform, WordPress has the lowest cost of building a website. WordPress duplicator, backup buddy, my easy backup, etc., are some of the plugins available on WordPress platform for exporting data. These tools make moving data from one website to another on WordPress hitch-free. So whether users are upgrading or changing a domain name, moving existing data from one place to another can be done with great ease. While on Squarespace, exporting data is grossly limited. Only contents like blog pages, galleries, etc. can be exported leaving other contents like videos and audios behind. If you want to turn a WordPress website into an online store, there are lots of e-commerce plugins that can make it very easy to get started. Also, there are plugins that make integration with online payment methods very easy. With tons of e-commerce themes to go with it, there is no limit to what can be done on a WordPress e-commerce website. In addition to this, many products as the users want can be added to the site. Whereas, e-commerce is so limited on Squarespace. As of now, there is only one payment option available on the website which is not even available in all countries. Also, the higher the number of products added to the website, the higher the cost of maintaining the website. As a hosted platform, Squarespace is solely responsible for the security of its user’s contents. So it is very likely for user’s websites to get hacked or compromised as it makes targeting its database very easy for hackers. But on WordPress, hosting and content management are done by different service providers. This makes security to be the responsibility of the end user. And security can be guaranteed for uses if the version of WordPress is regularly updated. Also, the plugins and tools should constantly be updated too. In addition to this, constant backing up of data is also required. Additionally, SSL certificates can be installed to ensure secure connection when browsing. WordPress is better than Squarespace as a website builder for any choice of website. Squarespace is user-friendly for a beginner as it is easier to use and all. Other than that there is nothing spectacular about it. Site mobility and exportation is easier on WordPress. It is also way ahead of Squarespace when it comes to managing an e-commerce website. In addition to this, there is an abundance of themes and plugins available on the platform. Then finally, being an open-source platform, there is always an upgrade of plugins and tools for WordPress development with an abundance of community support for help. Author’s Bio: Harnil Oza is a CEO of Hyperlink Infosystem, a mobile app development company based in USA & India having a team of best app developers who deliver best mobile solutions mainly on Android and iOS.